curling | Is this a Boarding House or Something? We had some very high highs this weekend and some very low lows! We were up and at the club again early Sunday morning for the “Sudden-Death Red Division Quarter-Final”. Evan had been fretting before the game and we heard him use the word “pressure” many times. We told the kids that the only pressure we were putting on them was to go out and have fun, just like they did in every other game. Todd took them over to the club, as he did the whole weekend and we followed behind. They did everything as a team this weekend. They had to have time to change their shoes, stretch out, sign in, etc. We grabbed seats upstairs in front of the window and waited for the game to start. We watched and listened as other parents & coaches were giving their teams last-minute words of advice, but we stayed out of their way and left it all up to Todd. When they hit the ice, we could tell that they weren’t as loose as they had been during the games the two days before. The skip of the other team was from Chester and exuded confidence from the moment they were out on the ice. I noticed that he had a big smile during the handshakes before the start of the game and was chatting easily in the house while the game was going on. At the same time, Evan was looking stiff and serious. As the game started, Uncle Mike and Aunt Kim arrived and then Ginna, Beanah & the girls showed up, although we hadn’t known they were coming. Apparently, the girls had been awake early, so they decided to hop in the car and come back! Sarah, especially, didn’t seem so thrilled to be there. We hadn’t brought the cooler in and she was looking for treats. The first end was pretty evenly played, but the other team ended up stealing one. The kids were having a hard time reading the ice, and in End 2 many of the first rocks thrown just slid right through. 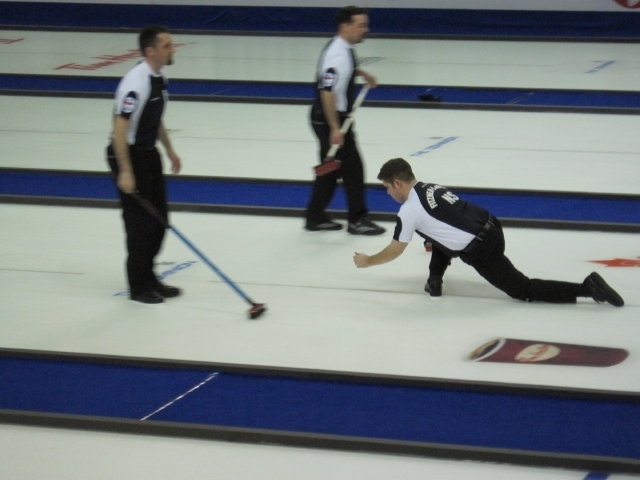 They did managed to each have a rock in the house in the second end, but their’s was closer to the button and they ended up stealing another point in the second end. In the third end, by the time it was Evan’s turn to throw, there were two rocks in the ring – one red & one blue and with red (them) lying shot. Evan and Lindsey discussed what to do and made the call that Evan would try to draw (a shot he’s confident with) to get at least one point. Todd was frantically trying to catch their attention from behind the glass to call a time-out. The skip of the other team noticed and pointed it out to Evan who did call a time out. Todd suggested that rather than trying to draw for a maximum of one point, he should try to take out the red and then they would be ahead with two. They went with that play and Evan missed the shot. The other team stole a third point, putting our team under enormous pressure in the final end! They had to get three to tie the game. In the fourth end, they started filling up the house with rocks. Their skip tried to knock one of ours out, but hit his own through instead. We had a chance!! Evan had hammer, and a chance to tie the game. He threw his rock, but it didn’t make it into the house. The other skip threw his last rock and knocked one of ours out, leaving us with no chance of taking three; the most we could get was two. Evan conceded the game and they all shook hands. Todd brought the kids upstairs and I could tell from the look on Evan’s face that he just wanted to be by himself. He didn’t want anyone congratulating him or even talking to him because he was close to the breaking point. We said our goodbyes to everyone who had come to cheer them on and sent my parents & the girls back home. They had been planning to leave the girls with us, but hadn’t brought bathing suits and we hadn’t checked out of the hotel yet, not knowing what they day held. And once they started, he couldn’t stop. He shut down in that moment and wouldn’t talk and refused to go back in the van with Todd and the team. He just wanted to be by himself to wallow. We all tried to encourage him to go with the team and the other kids were chanting “EVAN! EVAN! EVAN!” to no avail. Finally, in the interest of getting back to the hotel, we sent the others on and he rode back with us. During the ride, we tried to talk & reason with him, but he would have none of it. He shifted the blame to me, saying he was upset because I wouldn’t let him spend his own money! I got out at the hotel while Evan went to park with D’Arcy. I told Todd & Janice that I felt that the tears were not because they lost the game, but because he felt he had lost the game for the team. He had been off and didn’t make any of his shots. Everyone else knew that the team didn’t feel that way – except Evan. I don’t know what else D’Arcy & Evan talked about while they parked the van, but it was close to an hour later when they came in to the hotel room with a helmet full of treats. Evan apologized and gave me a big hug, then offered me a brownie he had bought for me. He had a different treat for everyone there. He got into his bathing suit and D’Arcy took him down to the pool while I packed up. I went down when all our things were together and he was in the hot tub by himself while the rest of the kids frolicked in the pool. They will be too old for pre-juniors next year, so have decided that Christopher will join the team and they want Alex to be their 5th. Not sure if that will work because he’s two years younger than the others, but we’ll see what happens! Todd is definitely interested in continuing on with them and we couldn’t ask for a better coach! We all said our good-byes and we went to Grandma & Grandpa’s for lunch. We had a great visit and Evan was actually quite pleasant. Grandma even offered to let them take their lunch in front of the television, but they opted to stay at the table with us instead! It’s not often that we get a quiet visit by ourselves with D’Arcy’s parents, so I think the boys felt quite special! We cut our visit short because we had to make another stop at Mike & Kim’s on the way out of the city; they had some stuff for us. 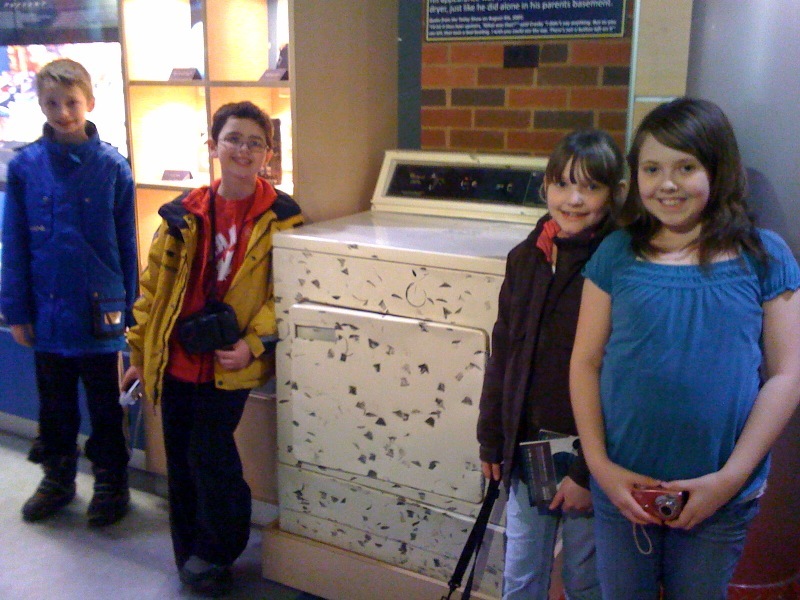 As it turned out, they had two antique curling stones – real ones, heavy ones – that they sent along with us. They boys think they are great! They slept all the way home and when we got here, Evan was shutting down again. My parents realized what was going on and left fairly quickly. As it turned out, the Women’s World Championship Curling was on, so we went back & forth between watching that and checking for the Little Rocks updates on the computer. The team that won against us was knocked out in the next game. Evan was still glum, so I dug out a book on “Curling like a Champion”, written by Colleen Jones, which D’Arcy had given me for Christmas a few years back. I was trying to find some words of wisdom in it for him. I showed him the book and pointed out that it even had diagrams of plays from actual big-name games. 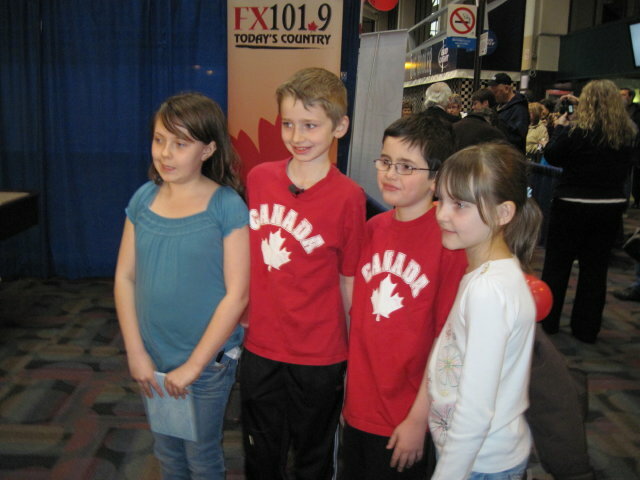 People who we had met while we were at the Brier. 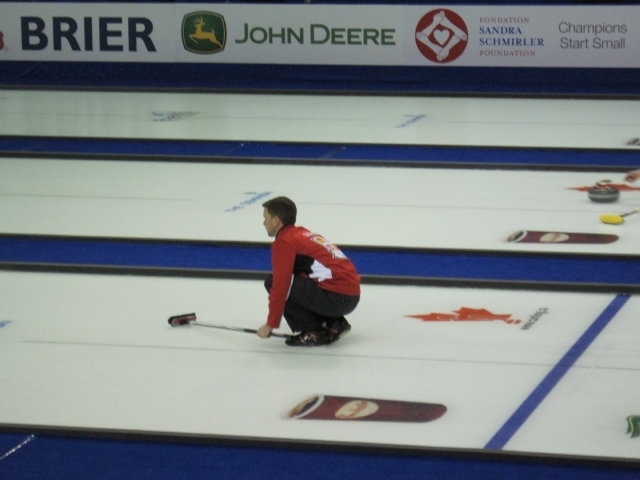 And then we saw that Jennifer Jones, who was the skip of the team curling in the game we were watching on television at that moment had made a play similar to the one Evan missed and she had missed it too! We had a great night after that. Evan was still glum, but not morose. Alex kept telling me that he was just happy that they had made it to the Red Division in the first place! We talked in their room long past bedtime, but it was good talking. While we were up there, D’Arcy brought the laptop up with some video clips of some of their best shots of the weekend that he had set to music. They made us all laugh and prompted Evan to start remembering the great shots he had made in the other games. They have curling on Tuesday and Evan has decided to leave band early so he can go and be with his team. After all, they have to start getting ready for Juniors! Get it? Rock on? 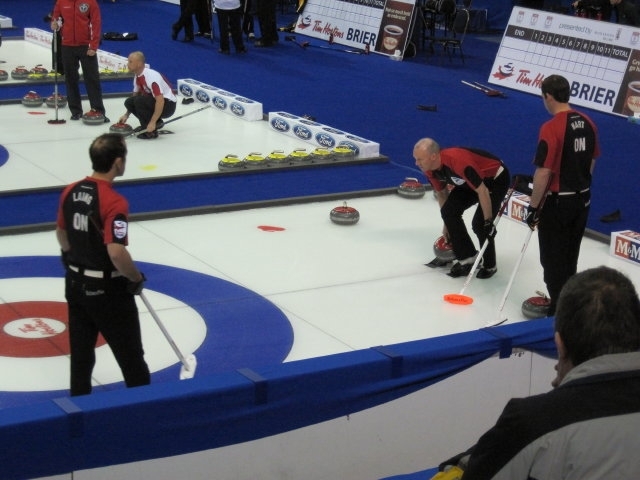 Yes, this post is all about curling! This plan all came together at the last minute. 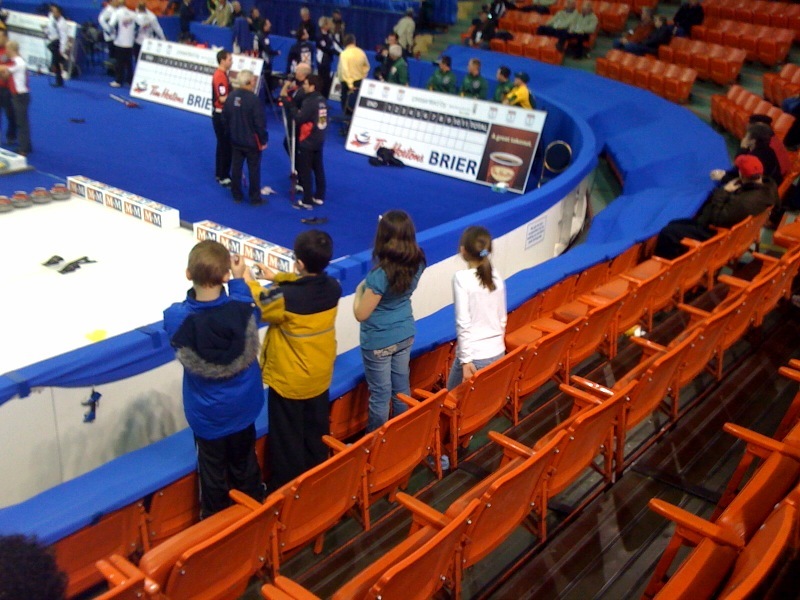 I had known a couple of weeks ago that the Hot Shots Competition would be happening at the Brier yesterday afternoon and that it was general admission. I thought about taking the boys, but it didn’t go much further than that. 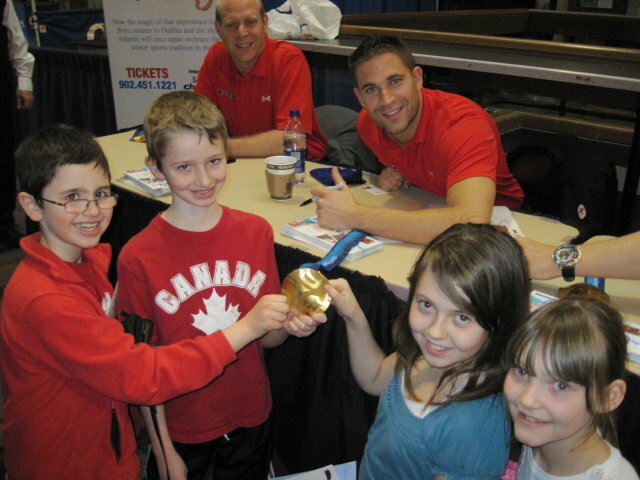 Thursday night, one of our guests whose children are also pre-Junior curlers, asked if we would be going and told me that Kevin Martin was going to be there signing autographs with his gold medal. When I heard that, my mind went into overdrive, trying to figure out how we could get there. I first asked the boys if they’d like to go? Duh. Then I called my mother to see if she would be able to take the girls for the day? No problem. 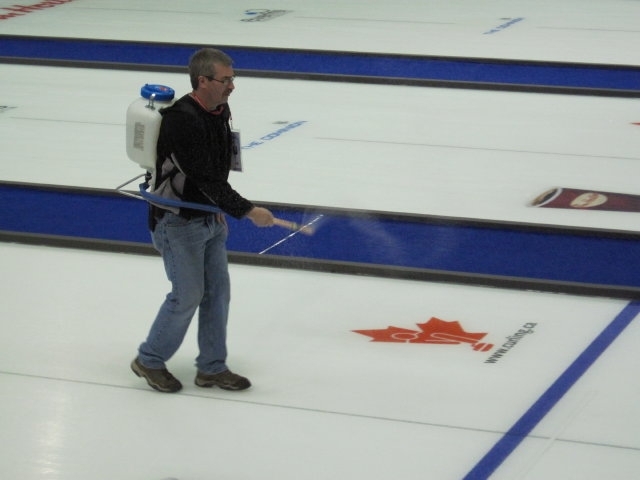 Next, I called the boys’ curling coach, Todd, to make sure curling was at four and explained to him what we were going to do, and that we would be back in time for practice. As soon as I hung up, I realized that his daughter Lindsay, on the boys’ team, might like to come too, so I called back and invited her along. Lastly, I called Madison’s family (whom I’d never met because D’Arcy usually looks after curling practice pick-up and my parents usually drop them off) and invited her so that the whole team could go together. It was somewhat awkward, since I don’t know how willing I’d be to send the boys off to the city with strangers, but at least they had met D’Arcy and were able to find out more about us through Todd. She was so excited to go, and I told her mother that she was welcome to come along too if she would like. 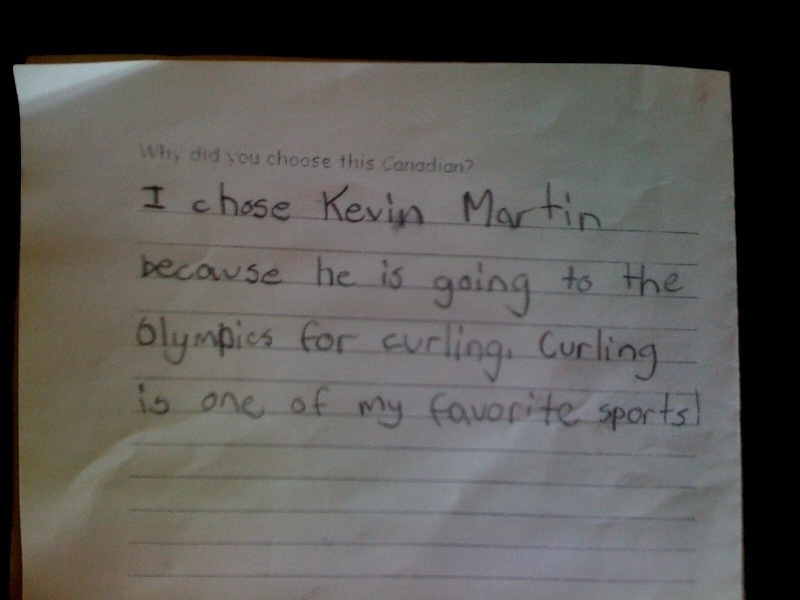 In the morning, we discovered that it wasn’t just Kevin Martin, but the whole Canadian curling team that would be there. I was happy to see that the snow had stopped and the roads were clear. When talking to my mother about our plan, we made the connection that she had actually taught Madison in Grade Primary and that she was one of my mother’s favorite students! Small world! Our friend Hope (who is 80) arrived at the door with a newspaper clipping for them to autograph. I offered that she could come along, and she laughed but said she couldn’t stand that long. With great excitement, we went to the school to pick up Evan, Alex & Lindsay. Evan brought along a biography he’d written of Kevin Martin in the hopes he would sign that. Lindsay’s mom (Alex’s teacher) was there to see them off. The drive to Halifax was smooth, with the kids chattering away excitedly in the back. 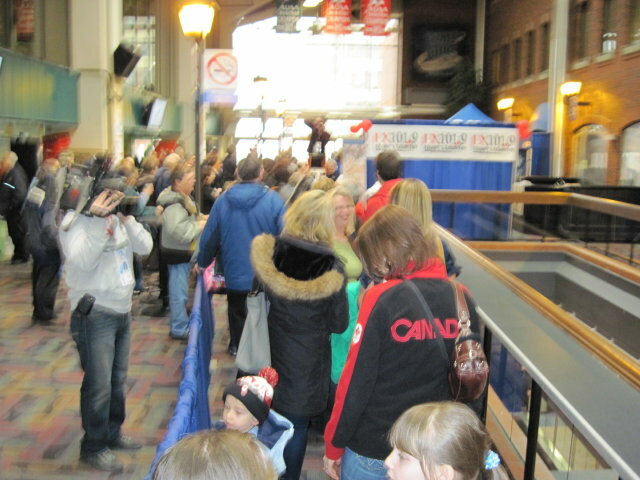 We were able to find a parking spot with little problem and went through the underground tunnels to the Metro Centre. Not knowing if we needed a ticket even though it was general admission, we stopped at the Box Office to inquire about protocol. We were told that Team Martin would be signing autographs at 11:30 and the doors would open then. I asked if that was what the group of people waiting by the doors was and the man told me yes, but that the team would be signing on the Brunswick St. Concourse so it would probably be faster to wait up there. When we got to the Brunswick Street door, we realized that people there were waiting outside. We made the decision to go back to where we were, inside & warm, figuring that we were early enough that we would surely get to meet him. And since we still haven’t totally come down off Olympic Fever, we thought we’d get a team photo in front of Sidney Crosby’s mother’s dryer, complete with dents from his hockey pucks! It didn’t take long before we got the kids to come back downstairs as the doors would soon open. When they did, we all went upstairs in a nice, orderly fashion, and got into a new line – about 20 people away from Team Martin!! An Olympic Gold Medal!! They are quite heavy - Kevin Martin told them they can only wear them a short time before their necks get sore! 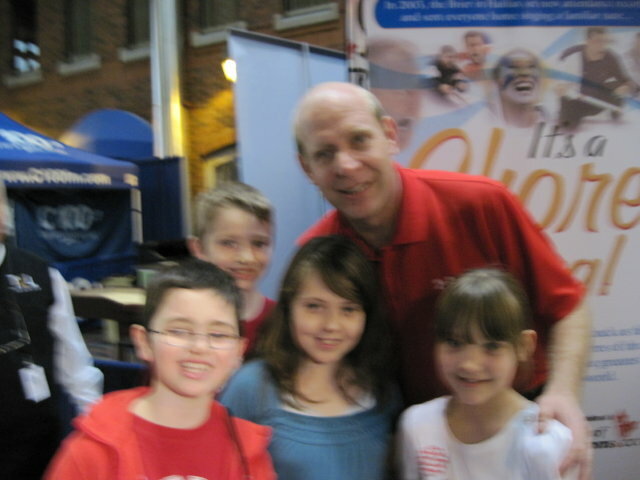 They were all so great with the kids and seemed so pleased to see young curlers! One of the tv reporters caught sight of Kevin taking an interest in what Evan was showing him. It was the biography he had written (which) Kevin did sign for him. 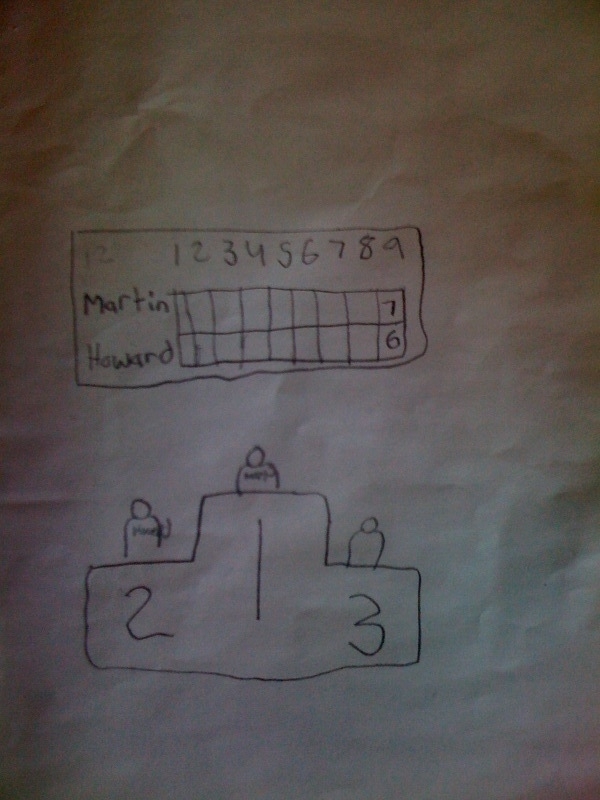 A drawing of Team Martin on the Podium, beating Team Howard in the Olympic Trials. Not sure Team Howard would have liked this picture so much! Alex was somewhat put-out that I chose Evan to speak on camera rather than him because he considers himself the better speaker. I tried to explain that Evan is the one who has been following curling since he was four years old and has been curling for three years. Also, Evan is the “skip” of their team and had written the project that got them noticed. I think he understood. 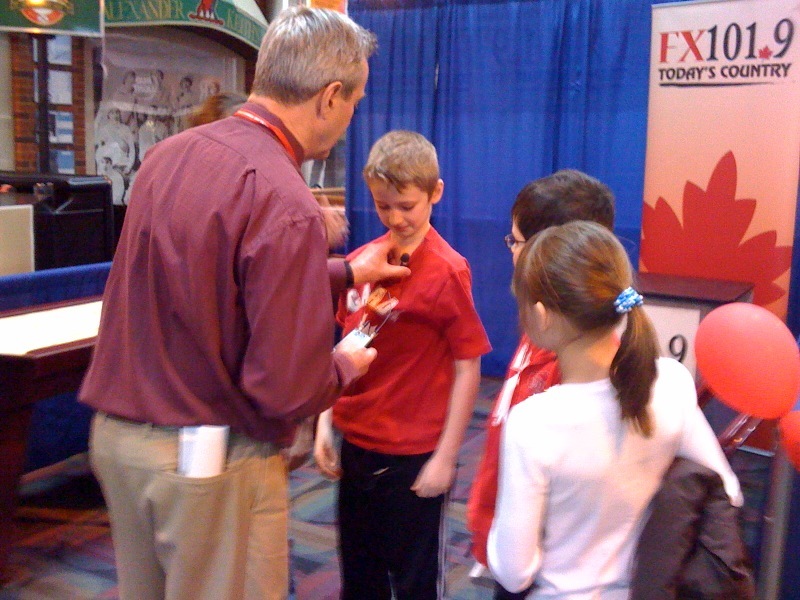 After this television interview, they were also interviewed by the Canadian Curling Association’s reporter. After all the excitement, we went inside and found our seats for the “Hot Shots” Skills Competition. 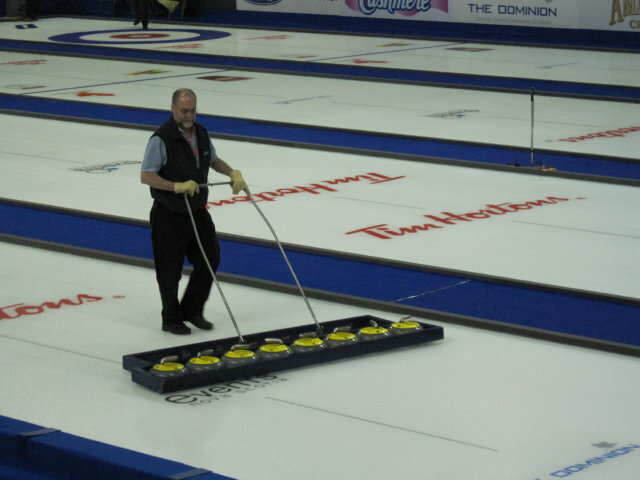 Each curler on each team plays six specific shots that are worth points. The top eight highest scorers go on to the finals. (today) The second for Team Manitoba got an almost un-heard of 29/30. They played six teams at a time and Team Nova Scotia was in the second group, so we were only able to stay long enough to watch them warm-up, but at least they saw us and knew we were there wishing them well! We got a text from our niece, Meghan, when we got home that Ian is in second place with 25/30 going into the finals! 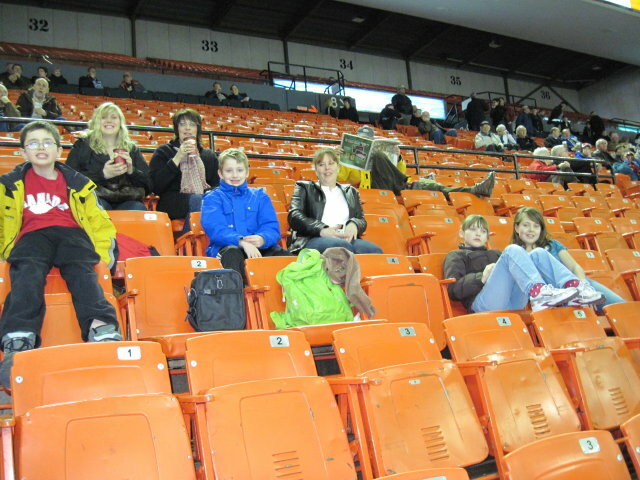 While the first group was curling, we noticed that Team Gushue was sitting behind us. 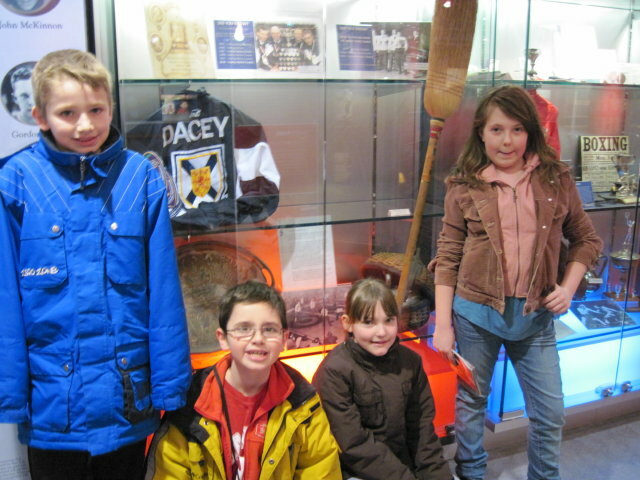 (For those non-curlers, they are representing Newfoundland, but were the Gold Medal winners in the 2006 Olympics!) 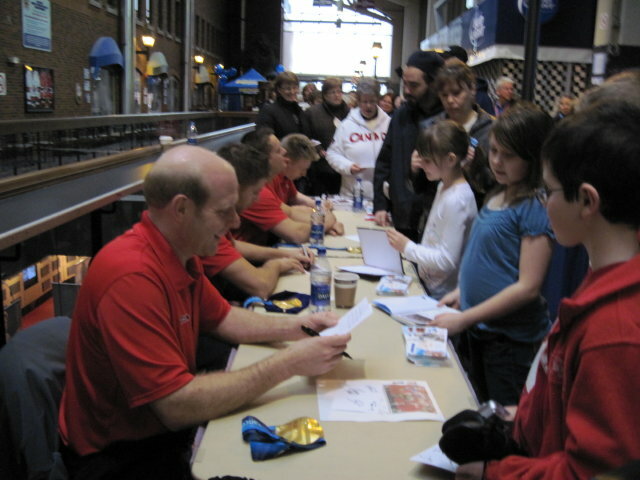 We went over to get their autographs and while there, the guys asked the kids who they were rooting for? Madison declared, “PEI!”, while the boys stated, “Nova Scotia!” The Team laughed and one said, “Well then no autographs for you!” They realized what they had done and everyone had a great laugh! We got their autographs, but unfortunately didn’t get a photo. We got to see how they re-surface the ice, in between groups. It was fun to watch them shave, pebble & “rock” each sheet of ice. Even more fun was learning that team Gushue likes to throw around the football while they’re waiting! We gave a huge cheer when Ian & team hit the ice! 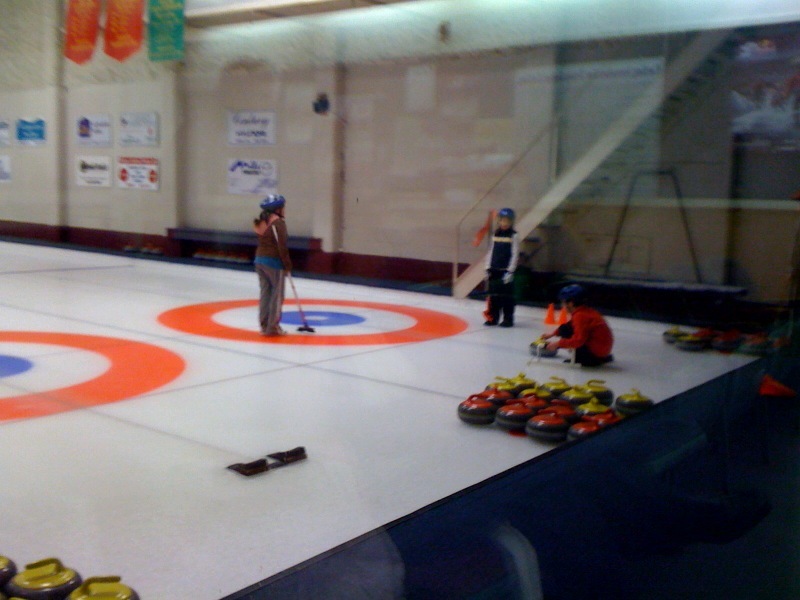 Too soon, we had to get ready to leave so that we’d be home in time for – curling practice! 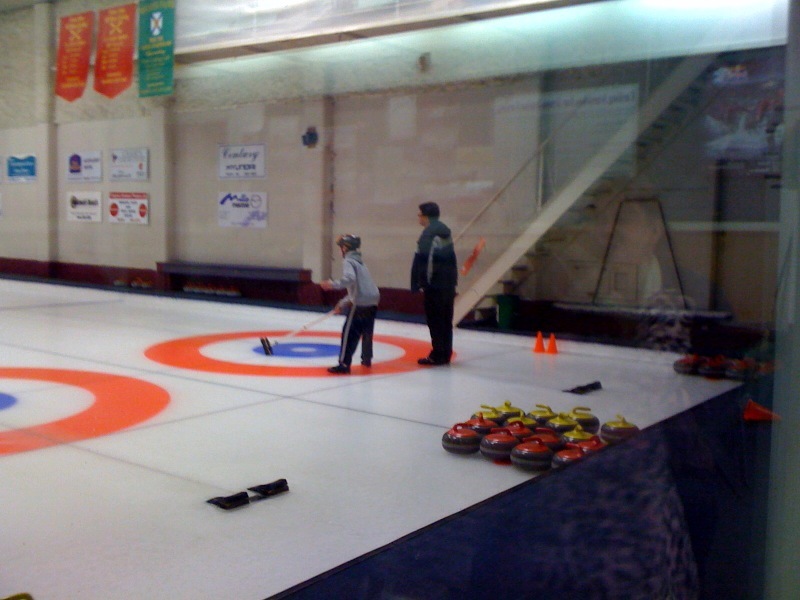 We had a fun, but windy drive home and the kids were still bouncing when we got to the Curling Club. Todd was able to get some practice out of them. When practice was over, we all went upstairs to the bar to watch their television segment. They were very excited and the men who were there having a drink were teasing them, asking for their autographs! It was such a fantastic experience. We all tried to stay awake to see them again at eleven, but it was futile. Too much excitement and we were asleep in our chairs. Good thing we taped it! Now to practice, practice, practice and get ready for their first competition as a team. I wonder if we’ll be seeing them at the Brier or the Olympics someday? Oh yeah – hurry hard!! So I just had to change our schedule this week over there in the sidebar. (I’m so excited!) 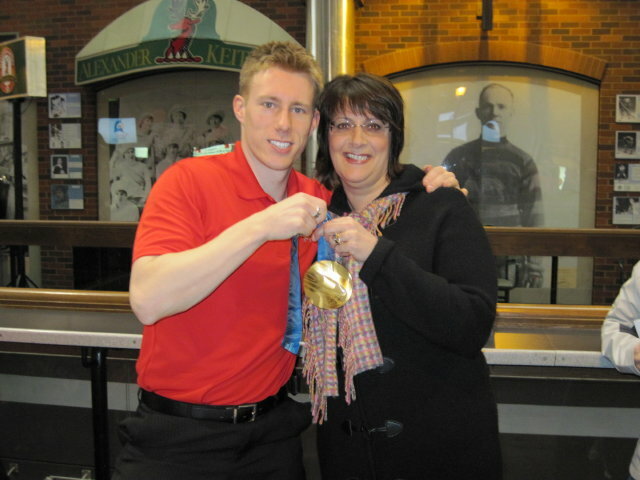 We just found out today that Kevin Martin is going to be at the Brier in Halifax tomorrow, signing autographs and getting photos taken with people while wearing his Olympic Gold Medal. (I think that deserved to be capitalized and italicized!) I will be picking Evan & Alex up from school in the morning, along with Lindsey & Maddison (the two girls on their curling team) and will take the four of them to meet Kevin, and get their photos taken with him (and his medal!) I asked Evan what he was going to take to get him to autograph?? D’Arcy suggested he ask Kevin to sign his underwear and tell him it’s “the final end”. 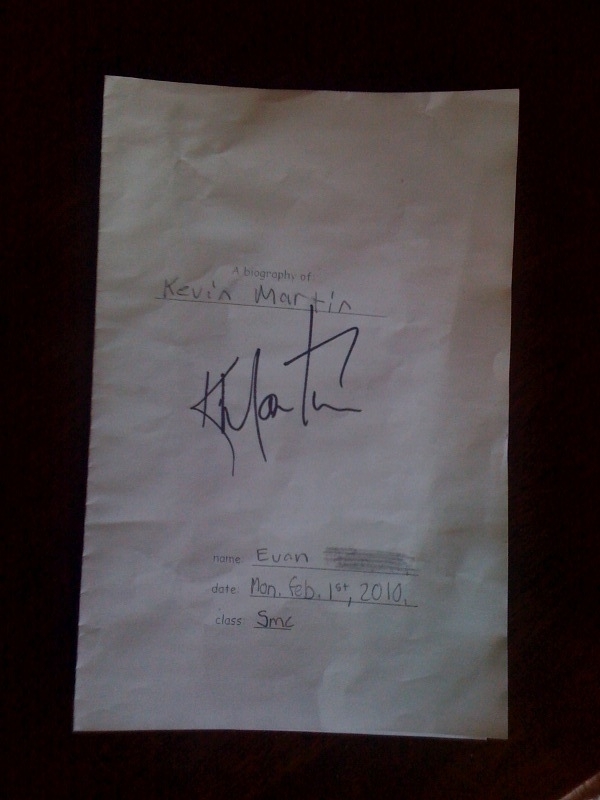 Evan has decided he will take the biography he’s been writing about Kevin Martin and get him to sign that instead. Afterwards, we’re going to go and wish Team Nova Scotia well. We’ve been following them since they were Juniors and our nephew, Chris, was on their team. They’ve stayed with us a number of times when they’ve curled in this area (and never been defeated when staying here, I might add!) so we feel a sense of ownership with them. Watching them on television when they were at Nationals as Juniors is what got Evan (and then Alex through Evan) hooked on curling in the first place. We’ll watch some of the “Hot Shots” competition and then head home in time for curling practice. Now, for a change, I’m not hoping for a snow day. Team Fitzner-LeBlanc have curled together since they were seven. Who’s to say where this team of pre-juniors may end up with the right inspiration?! It was a big day yesterday for Olivia & Evan. We finally got the call that Olivia has an appointment with the pediatric GI specialist at the IWK!! (May 7th) She was referred last July, so the appointment has been a long time coming! It’s moments like that which make it all the juggling and running around worthwhile! It was a busy, family-filled weekend. We spent Friday putting the house back in order and I am so happy that we got finished! There were some tense moments while D’Arcy & I moved the piano to it’s new home in the living room after the kids went to bed, but we did it with only one small mark to the floor and only a few swear words between us. Playing together to keep Olivia (&Alex!) occupied! Right at the end of Evan’s game, Olivia fell down the stairs where we were sitting and got a huge scrape on her back when she fell against the doorstop. I ended up taking her out, screaming. I stopped to talk to another parent on the way out, and Olivia did a face-plant on the sidewalk! It wasn’t her day! She fell asleep in the van and we took the kids through the McDonald’s drive-thru for lunch. Olivia & Phinn - love the headband! A bit of fun with cousin Mike - at one point I had to explain that "Actually, Mike is a grown-up!" We ended up calling Karen & Kevin & the boys and they came down to join us for homemade pizzas. The cousins all played outside for a bit and then watched a movie together while the rest of us ate. Sunday, was a beautiful Spring day! D’Arcy & Evan headed over to the Curling Club in the morning for the family bonspeil and Alex, Sarah, Olivia & I walked over to watch. Unfortunately, they lost the game we watched, but won their second one. Evan was thrilled to win a shirt, a game & $5! Evan (and we!) thought it was pretty neat they used a picture of him on the poster! Alex is competing in the Music Festival this week, so he & Maddie practiced “Jolly Holiday” from “Mary Poppins” at our place in the afternoon. When D’Arcy & Evan got home, we all played outside in the sunshine with NO jackets! (First time this year!) D’Arcy cut down back one of our Mock Oranges before the chain-saw quit. A man and his chain saw! I barbequed (again, a first of the season!) and had a small fire. Everybody was tired & worn out by the time supper was over and went to bed quickly. Evan was tired enough, that he started to spill a lot of feelings he’d been bottling up about how much he hates school right now, etc. I actually held him on my lap and we talked a lot of things out. I don’t know how to make it better for him at the moment, but as long as he knows we love him and he can talk to us whenever, hopefully he’ll be alright.